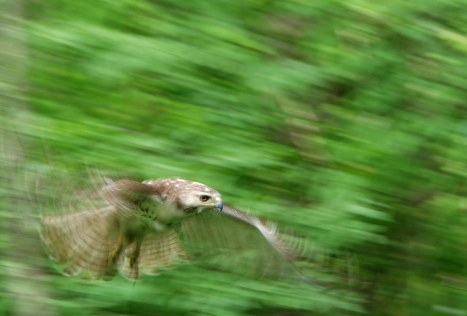 What follows will not be elegant artspeak about how certain photographers can capture not only the beauty but the spirit of wild birds, although my friend Russ Cusick, who took these photos, has certainly produced some of my favorite avian images. This is more of a cautionary tale about one of the perils lying in wait for wildlife rehabilitators who decide to take shortcuts. 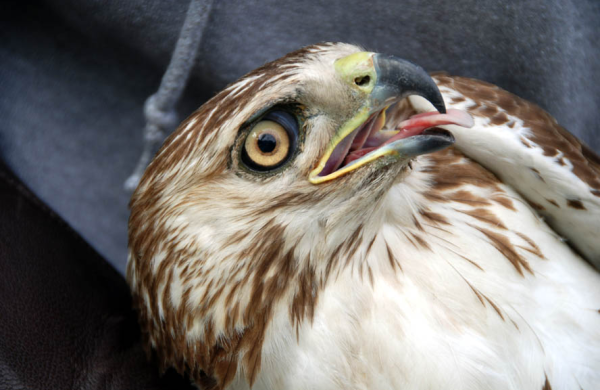 Many summers ago I received a young Red-tailed Hawk who had been found standing on the side of the road. He was in good weight, showed no signs of head trauma, and x-rays revealed nothing broken. However, since young redtails don’t normally loiter by the side of the road (unless they’re having a meal), much less allow a random human to pick them up, I figured he had probably bounced off a car. I gave him some anti-inflammatories, let him rest in the clinic for several days, then put him in my flight cage. I did not have a proper conditioning cage for a Red-tailed Hawk, which should be 10 feet wide, 12 feet high, and 50 feet long. At that point I had two flight cages 10 feet wide, 8 feet high, and 20 feet long. They were meant to be super-strong, super-sized songbird cages, but eventually ended up housing almost everything under the sun. 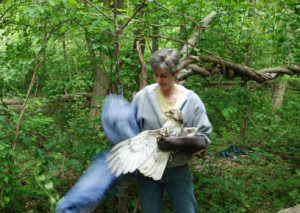 They worked well as mid-point cages for certain large raptors; I could get the birds out of the clinic, give them room to move around, and soon take them to various friends who had huge flight cages for conditioning before release. 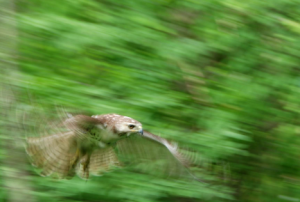 When I put the young redtail in one of the flights, he moved perfectly well. He could levitate off the ground and onto a high perch. He showed no signs of soreness. He flew from one end of the cage to the other, turned, and did it again. He did this for several days. I had so many birds. I was sooo busy. So I skipped the last step. Instead of taking him to my friend’s huge flight cage, I took him back to where he came from. My photographer friend Russ came along for the ride. 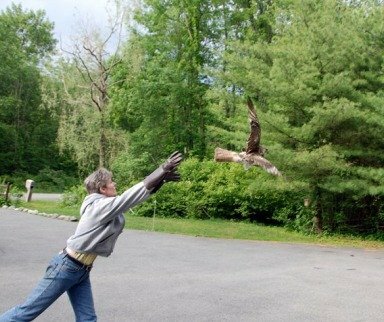 Here I am, releasing the young redtail. Note the suddenly lopsided bird. Bird in motion, just as he had been doing in my flight; only this time, he wasn’t flying so well. At all. When he headed into a wooded swamp I grabbed a blanket and raced after him, cursing both my so-called rehabbing skills and the fact that I’d worn flip-flops, which were sucked from my feet the second I started running through the swamp. 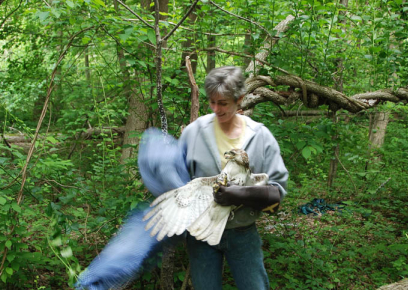 Here I am, emerging barefoot from the swamp with the redtail, whom I managed to catch despite the mud, the thorns, and the odds. Properly chastened, I brought him home and went through the process again; then I took him to my rehabber friend’s huge flight cage, where he flew solidly for another week before his successful release. Moral of the story: no shortcuts. Wear sneakers. Where Are You Birding This Second Weekend of October 2014?